The JetPak collapsible DVX baggage container enables carriers to store a large quantity of baggage containers in a very little space. The JetPak II can be set-up quickly to meet increased or unexpected demand. The JetPak is also available in all plastic designs for long term use. The JetPak collapses to a height of 5.5 inches, minimizing required storage space and allowing the container, once collapsed, to be utilized in stacks of ten. 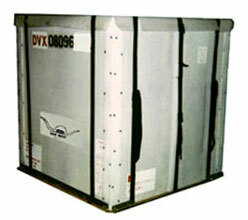 The height of the stacked containers adheres to the ULD specified height limit of 64 inches/1,626MM. This allows ten collapsed containers to be moved via air transport while occupying the same space as one set-up container. The use of self locking and fully adjustable components allow the JetPak to be set up and collapsed in a minute. United Airline's usage studies show the average life of the JetPak far exceeds that of its competition. The JetPak is priced considerably lower than other temporary containers and requires no costly, ancillary equipment, such as storage and transport pallets. The low delivered price, along with the JetPak's ability to out live its competition, makes the JetPak's total cost per use an attractive benefit. At a tare weight of 95lbs/44kg., The JetPak is lighter than its temporary container competition and a fraction of the weight of the conventional aluminum containers. The full length panels along both sides of the container, were designed to allow quick and easy access into the JetPak. The JetPak can be custom designed to meet your special needs.